 [SAFE, EFFECTIVE, HUMANE] Immensely Popular, Fully Waterproof E-Collar used by Expert Trainers & First Time Pet Owners. This shock collar Can be used to help correct Barking, Walking, Leash Training, Sitting, Aggression, and other Behavioral Obedience.The power-saving standby mode can prevent any misoperation on the remote controller and carry the remote controller at will without worrying about accidental electric shock to the dog.  [4 TRAINING MODES] The electrostatic shock and vibration modes have customization levels ranging from 1-100 for personalized training. You can also use the Tone (Beep) mode, which will sound an audible warning. The training light can help dogs focus. Electric shock setting is recommended only in emergency situations and is not recommended as a form of positive behavioral training.  [1000 FT REMOTE CONTROL & LCD DISPLAY] Wireless control is up to 1000 feet remote range. 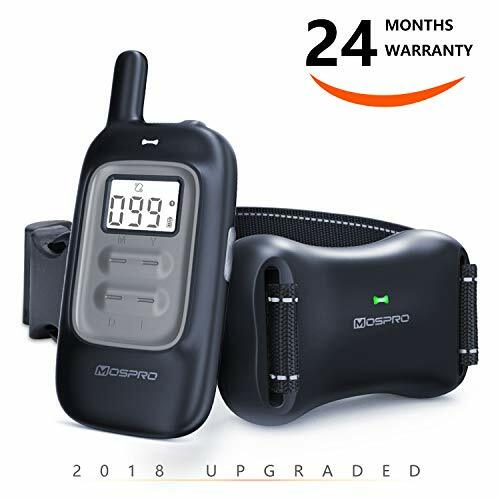 The upgrade design makes the signal more stable, and it is easy to train your dog in the park or backyard using the MOSPRO dog training shock collar. The controller also has dual channels to support training of 2 dogs at the same time. The large LED display with backlight design is convenient for you to intuitively control various functions. ☔☔ [RECHARGEABLE,WATERPROOF & DURABILITY] ☔☔This dog bark collar boasts Lithium- Polymer batteries that charge in 2-3 hours and lost for 15 - 20 days. The waterproof rating is IP67,so the collar receiver doesn't need to be taken off when your dog goes swimming, chasing toys around the swimming pool or playing in the rain.Also this strap is adjustable and durable,perfect for all size dogs.  [24-MONTH WARRANTY] Equipped with 4 x insulated silicone, it is friendly to small dogs. All our dog training collars come with 24 hours professional service center, 30 days full refund, 24 months warranty and technical support. Excellent customer service leaves you no worries about purchasing. If you have any questions or dissatisfaction, please contact us as soon as possible.